Posted on May 18, 2014 under Current Affairs. The results are out and the BJP has gotten itself a historic landslide victory !!! This means that India can have a stable government for the next 05 years and one not hobbled by coalition politics. Hopefully the new government will use the clear mandate given by the people to end the policy paralysis that plagued the last government and make some developmental progress. However this is not the main point of this post. In my last post on the elections, I looked at search volumes for each of the leading candidates by region and noted that none of the leading candidates evinced any interest from the south and south-east of India. 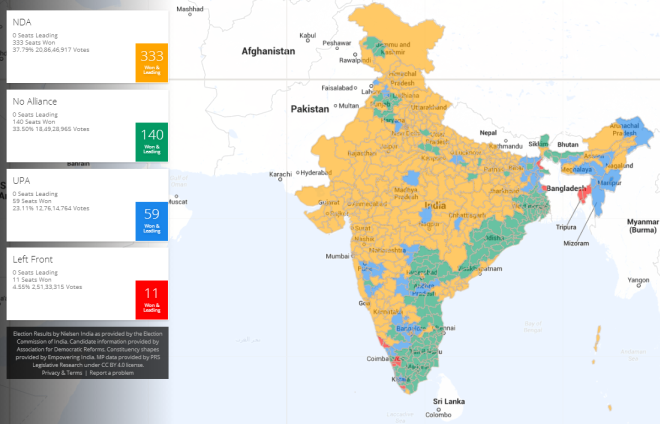 Looking at the map of India after the results (Google Live Election Tracker), seems that this is the only region where BJP has not made a clean sweep or any in-roads at all. So does this mean that search volumes (or the lack of them) may be a good predictor for election results? Food for thought !!! This entry was tagged under: Elections. Both comments and pings are currently closed.